Before the illiegal attack on Libya thousands of women were attending university. Their acadamic achievement was recognized not only with marks but also with scholarships that allowed them to study abroad. When they married, the government of "Mad Man" Qaddadfi gave the couple, aside from free education, a $50,000 start-up, free healthcare and more, all of it paid for by the state-owned oil industry. Barack Obama and Hilary Clinton with a billion dollar budget engineered what they referred to as a humanitarian war and the women are back in their homes terrified at having to live under Sharia law as the new puppet government insists. No women on the strets now; just young thugs shooting automstic rifles. It is to the eternal shame of the mainstream media that they have been part of this deceit. Character assassination is a key weapon and those employed as psychological attack dogs scratch the bottom and come up silly. A photo has been circulating of a room in Qadaffi's centre in Tripoli. The cutlines and the voice overs refer with mock horror to a double bed with a conservative quilt and two bedside table lamps giving off soft light. Is that the best they can do? Shame on them. Meanwhile, we're glad to be back. I'm happy to report that our appeal for funds has prompted the best return ever. It's still far short of what we need but the response has been most encouraging. Let me repeat here our appeal with an update. Precious money has been arriving via PayPal and Canada Post in amounts of $25, $30, $50, $80, $100, $180 and yes, one for $300. This allows us to shrink back from the brink but we desperately need more to survive. We have to scan the world to bring you the truth of events and ideas that are developing in rapid succession. It takes 100 hours a week to get True North Perspective to your email box. We're being read in up to 121 countries. Your money buys us time. Please give us whatever you can afford. We need you now. Below we repeat two brief Editor's Notes. One justifies our claim that True North Perspective publishes in the best traditions of Canadian journalism and the second why it's vital that we receive financial support from our readers. 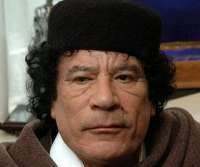 Finally, a story you won't find in the corporate news: WikiLeaks exposes Washington's close ties to Gaddafi. Without further ado, we'll leave you with them. — Looking forward, Carl Dow, Editor and Publisher,True North Persepective.